Finding just the right lamp to match your partner's taste in interior design can be as tricky as proving you're not afraid of the dark now that you're an adult. Well thankfully Mclanes Memories have killed two Ultimos with one stone, with this Iron Man helmet stained glass lamp. Having already done a similar project of Star Wars fan-favourite Boba Fett, Mike from Mclanes Memories ensures this Avenger shines brighter then a uni-beam on high and would make the perfect focal point to any lounge, bedroom or area with a matching power socket. 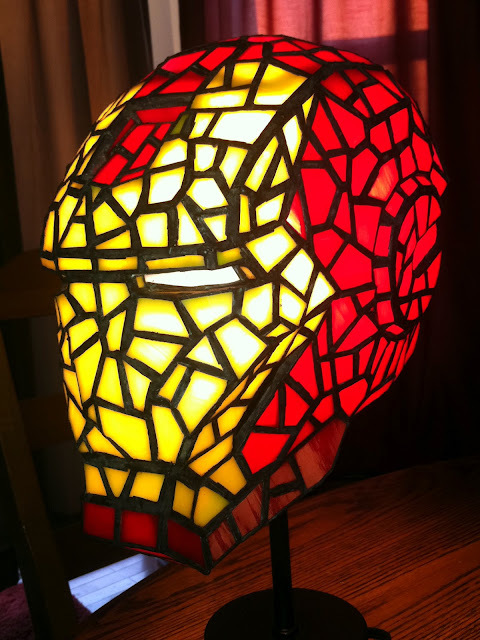 The modern Iron Man is a perfect match for the look of this artisan craft as well! To see more from Mike and Mclanes Memories, click the jump. Hey CBL = Glad you liked it too. Mike says he's looking at making more in the series, so I wonder who he looks to next! Nice CBL as your icon suggests I guess! Me Id like Human Torch, or maybe Colossus! But, and as you referred to a "series". I was thinking in the Avenger series. ...X-Men series, Fantastic Four series, and so on. But the Human Torch would be Great! (I bet you thought I was going to say "HOT". ;) However, and thinking in terms of "Mclanes Memories", ..."Spiderman" is the money maker. Not to mention his costume design lends well to the joints in stained glass construction. In fact, my wife (who's not a fan of comics) thought it was, Spiderman. But I still like the Human Torch idea, better. I mean, you can just picture it in your mind. Wow! Thanks CBL - blad you liked the idea. I think it would be pretty sweet, but like you and your wife say, Spider-Man is where the smart money is at. Wife's aye? Always the clever ones!